An avenue of trees was planted in 1918 as a living memorial to commemorate those who served in World War One. Each tree was named for a soldier or Red Cross worker and planted by family or community members who knew them. The trees lined William Street and, for the soldiers from the Gnarpurt settlement, Heriot Street. The trees were fenced against wandering cattle. The planting was of a range of eucalypts and included a number of rather unusual and beautiful towering varieties. 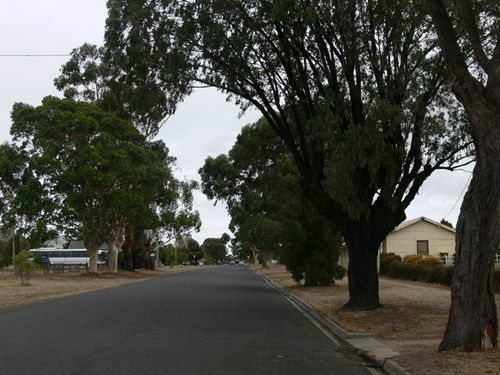 Of the original 190 trees there is still a number of trees remaining: these include the lemon-scented gums with solid white trunks planted on corners to make them more visible to vehicles at night, the original and replanted iron barks with grey leaves and rough black bark, and on the east end of William Street some of the original sugar gums still tower overhead.